This is an advert, from DOCTOR WHO MAGAZINE issue 101 (June 1985), for one must have been one of the dumbest pieces of merchandise from the era of the original series: the infamous DOCTOR WHO COOKBOOK as penned by a certain Gary Downie. As far as I - and, I suspect, most casual WHO fans were concerned - Downie was (if you cared at all) a sometime member of the show's production team. 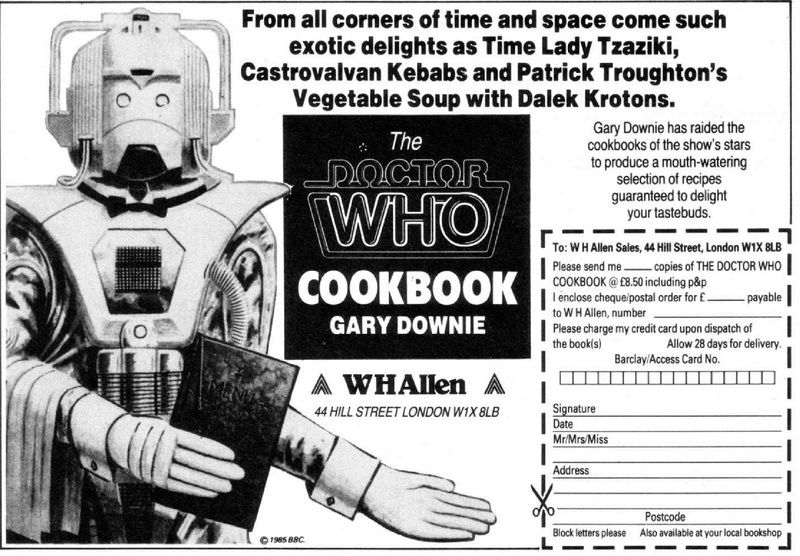 Even the fanzine DWB at its most vicious seemed to stop short of revealing that Downie was also the long-time partner of series producer John Nathan-Turner. If Poundland had existed in 1985, I feel sure their branches would have been overflowing with this debacle by the end of the year. For the full JN-T/ Downie story, you ABSOLUTELY have to read Richard (ex of BLUE PETER) Marson's biography, published by Miwk. It's a compulsive page-turner which generated headlines by revealing that both had an eye for the younger (and, at that time, underage) male fan. But, beyond the scandal, its a fascinating account of a (sometimes destructive) relationship which spanned decades as well as a detailed insider view of how BBC Television operated and - ultimately - turned its back on the show and its producer.